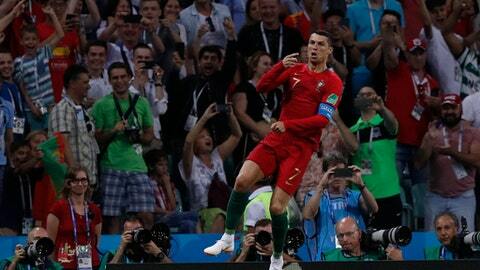 MOSCOW (AP) — Cristiano Ronaldo and Portugal can send Morocco to an early World Cup exit on Wednesday. A second straight defeat would ensure elimination for the North African side which has not let an opposing player score in this World Cup campaign since 2015. An own goal by Morocco forward Aziz Bouhaddouz in stoppage-time was decisive in a 1-0 loss to Iran last Friday in a game it mostly dominated. “Because they lost the first game, Morocco will give everything. They have no other choice,” Portugal forward Andre Silva said. Portugal’s opening 3-3 draw with Spain in a World Cup classic means Morocco must take at least one point before the Spanish play Iran in Wednesday’s late game in Kazan. That will mean stopping Ronaldo on the main stage of Luzhniki Stadium in Moscow after his irresistible hat trick in Sochi, including a stunning late free kick. The Morocco defense, however, is proven to be resilient. Anchored by Juventus center back Mehdi Benatia, the Atlas Lions kept six clean sheets in its African qualifying group. It was back in November 2015 that Morocco conceded a single goal to Equatorial Guinea in a two-leg qualifying round won 2-1 on aggregate. “Even after the defeat (to Iran) the atmosphere in the squad is still excellent,” Fajr said. Morocco will aim to convert any early pressure and scoring chances into goals this time, having wasted 13 attempts and 64-percent possession against Iran. Forward Khalid Boutaib could get his chance to start after Ayoub El Kaabi was preferred by coach Herve Renard in St. Petersburg. Noureddine Amrabat is a selection doubt after sustaining a head injury against Iran. Though he was reported to be taking a week-long break from training, the 31-year-old midfielder has been back in training working separately from the squad. There was high drama in stoppage time the last time Ronaldo and Benatia faced each other, in a Champions League quarterfinal, second-leg match in April. Then, Real Madrid and Juventus were heading to extra time with each winning 3-0 away from home. Benatia then pushed Lucas Vazquez in the back as the Madrid and Spain player went to shoot. A penalty was awarded, and Juventus goalkeeper Gianluigi Buffon was sent off for his furious reaction to the referee. Ronaldo scored, inevitably, and Madrid advanced on its way to a record 13th European title. Morocco and Portugal have been down this road before, in a 1986 World Cup group in Mexico. Facing three European opponents, Morocco drew 0-0 with Poland and England, then beat Portugal 3-1 in Guadalajara. Morocco topped that group to enter the Round of 16 and Portugal finished last.